Breaking News: It’s hot outside. Sure, we may be sprinting headlong into fall (yay, we get to put clothes on!) but in the meantime, it’s still. really. hot. But there is an upside to these dog days of summer — frozen treats! Ice cream for lunch? Totally acceptable. FroYo dinner? It’s a weekly occurrence. Raspberry-mocha-Frappasomething with extra whipped cream on top? Well, it’s not like you can drink hot coffee in this weather. Believe it or not, there is a better way to appease your sweet tooth! After all, these store-bought treats, though awesome, are not exactly bikini-friendly — not to mention, daily Frappasomething’s ain’t easy on the wallet. 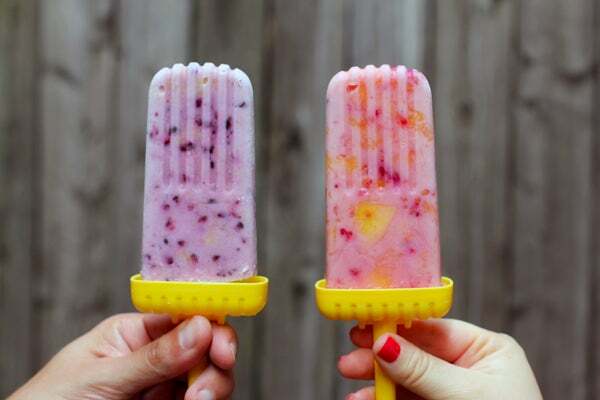 That’s why we created this easy, junk-free recipe for frozen yogurt fruit popsicles. It’s a quick and flexible DIY that you can whip up in minutes and tailor to your taste (we listed three of our faves below). Plus, it’s so utterly guiltless that you can go ahead and have two — you have to get your calcium somewhere, right? Whether you make them for a BBQ dessert, a super-healthy post-workout treat, or a late-night snack after a sweaty summer night out, these creamy dreams are our new favorite everything. Toss both fruits into a large bowl. Fresh is best, but if you have a bag of frozen berries in your freezer, then go for it. 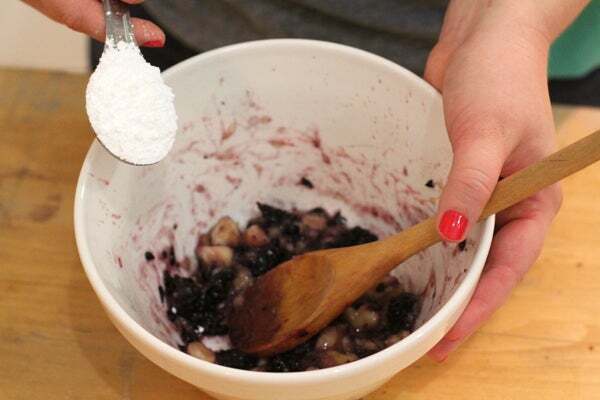 Mash them a little with a wooden spoon — we like some bigger bites of fruit in there, but if you prefer a smoother texture, just keep mashing. Pour in sugar and stir until well combined. Big fan of tart yogurt? Skip the sugar! Good for you! 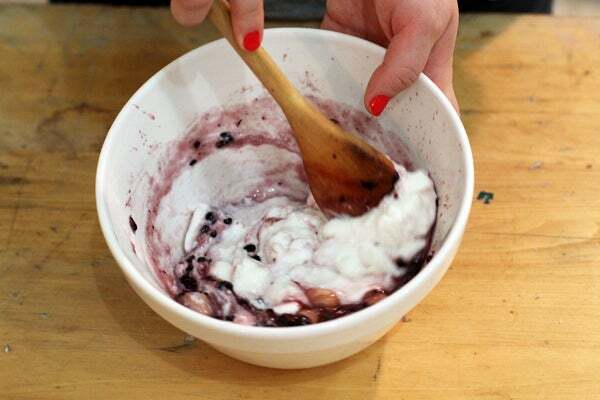 Mix in the yogurt. 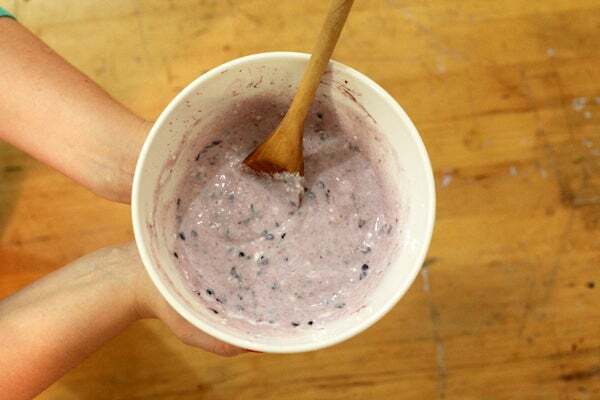 Stir thoroughly to make sure there are no rogue yogurt lumps in there. 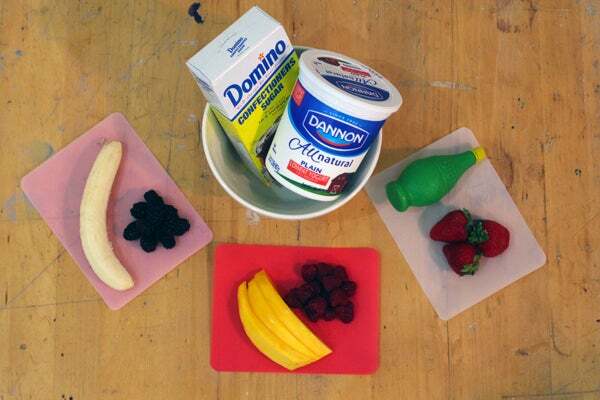 You want the fruit evenly incorporated. No fruit on the bottom here! 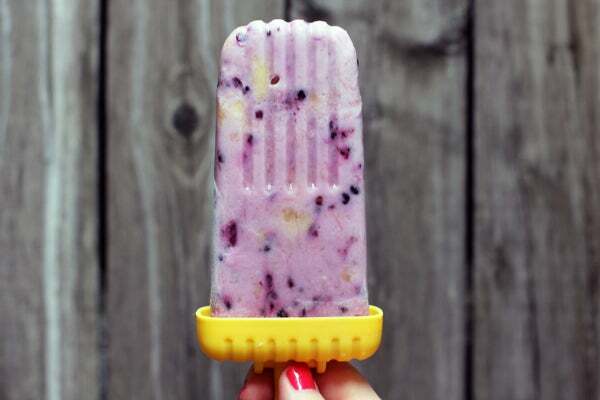 Spoon the creamy goodness into a popsicle mold. Don’t have a set? 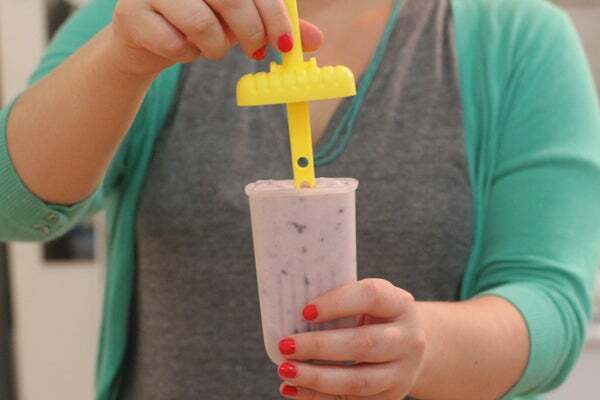 A cup with a spoon stuck in the middle makes a perfect substitute. Yum! Pretty, too! But seriously — YUM.